Gain Exposure for Your Business at this Premier 5K Race! We are excited to tell you about a great opportunity for your business or organization to reach runners and walkers in the Kansas City Community. 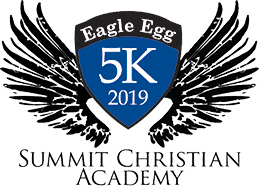 The Eagle Egg 5K, a benefit for Summit Christian Academy, is a run/walk located in Lee’s Summit, MO and is fast becoming one of the premier 5K races in Kansas City. Friends and families from all over the greater KC area will be there to run, walk, and support a worthwhile cause. We think that a partnership between your business and the Eagle Egg 5K would be a great opportunity to support a fantastic academic institution and provide exposure for your business! We invite YOU to be a part of the 2018 Eagle Egg 5K Run/Walk as a Sponsor and by clicking the information below you will see all of the Sponsorship Benefits for the 2018 race. As you consider making this part of your charitable contribution for the year, please do not hesitate to contact Sarah Coats at 816.525.1480. Also, feel free to share this information with any businesses you frequent that may be interested in furthering our mission. SCA is a nonprofit, nondenominational Christian School. We are also partnering with Rachel House by collecting donations of diapers and baby wipes. Thank you so much for your tax deductible donation.